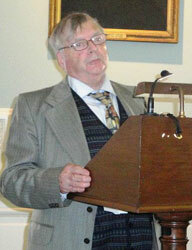 The Society's 76th Annual General Meeting was held in the Surgeons' Hall, Edinburgh, on Saturday 5 November 2011, when the annual lecture was given by Professor Nial Osborough, Emeritus Professor of Jurisprudence and Legal History at University College Dublin. His title was 'Law at the Edge: Legal Encounters on a Maritime Periphery', an intellectual itinerary with principal stop-overs at Rousay, Tiree and Colonsay, and at Great Saltees, Skellig Michael, Great Blasket and Arranmore. The 77th AGM will be held in Edinburgh on Saturday 17 November 2012, when the annual lecture will be given by Professor Norma Dawson, Professor of Law, Queen's University, Belfast, and President of the Irish Legal History Society. Further details will be published in September. 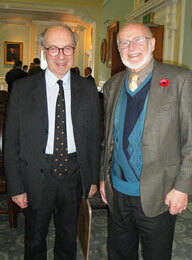 More pictures of our AGM are available on the Society's Facebook pages.